Mmm, who can say no to crepes? After a filling lunch at Saffron and some shopping in Tianmu with some friends, one of them mentioned that we had to go to have crepes at a shop they had been to before. I thought I was full, but my dessert stomach opened up and said, yes please! When we ended up at the cute shop, I realized I had read about Creperie La Bretagne and had it on my mental to-eat list (since it was mentioned by reader Josh on my Crepes Suzette post)! The shop was narrow, but cozy with a second floor that I didn't explore. My friends said that it was bigger than the previous location that they had been to, or maybe they had expanded? It was hard to pick just one from all the pages of dessert crepes to choose from, and I couldn't decide! They had the basics- honey, lemon, cinnamon sugar to the more unique- handmade caramel, black cherry and condensed milk, or banana contreau and ice cream. I ended up settling on Banana Nutella. Luckily, my friends picked my second choice, Cinnamon Apples. You can also make your crepe into a set with drink for NT$180. The crepes are made fresh to order, and by the front window, so passerbys can watch and be tempted to come inside and order their own. Creperie La Bretagne also offers main dish crepes, such as mushrooms with traditional french sauce, german sausage and cheese, french country style with ham and eggs or smoked salmon (NT$210); as well as a coffees, lattes, teas and bretagne apple cider. A few minutes later, our crepes arrived. I was slightly surprised to see they were square rather than folded over like a triangle. But who cares if it tastes good right? Mmm, mmm, mmm... the banana nutella crepe (NT$110) had plenty of sliced bananas and hazelnut chocolate sauce spread inside. I only wished the crepe was a tiny bit bigger. If you cut it into bite sized pieces, it would be about 12 bites. I traded a few bites of my crepe for a taste of my friend's cinnamon apple crepe (NT$120) and it was also mmm, mmm, mmm. The soft apples were sweet, but also coated with a thick layer of cinnamon. He also ordered it with a small scoop of ice cream that I didn't try. 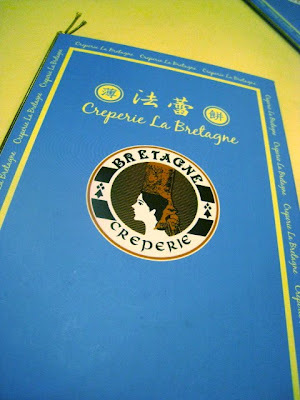 I could see how Creperie La Bretagne could be a popular hangout on the weekends for the Tianmu neighborhood. Thanks to my friends J and A for having a craving for crepes (and Indian food) that day so we could check it out. If you are now craving crepes and don't live near Tianmu, don't worry- there's actually a good crepe place called Crepes Suzette tucked around the corner from McDonalds in the NYNY mall that I have yet to write up. You might have spotted Chianti while driving in the alleys near Sogo. Or maybe more noticeably, its can't-miss-the-giant-signage next door neighbor, Hello Kitty Sweets. There is some nice sofa seating in the front, for waiting or afternoon tea, as well as a freezer of house-made gelatos and cakes to admire by the front counter. I arrived for lunch with a few friends before they officially opened, but they were nice enough to let us wait inside on the sofas rather than outside while they got ready. Upstairs there is also a room for private dining, or my friend said that you could reserve the second floor for a private party. 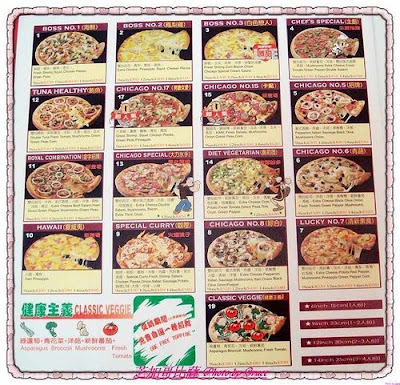 The menu is in English and Chinese, with lots of pictures of appetizers, salads, pastas, pizzas and grilled meats/seafood. There is also a set menu lunch for NT$500-$680 from which you can choose various pastas and risotto dishes, or osso bucco and grilled garoupa. I think I ended up being the only one to order from the set menu- one of my friends ordered a crab salad and crab risotto and the other ordered a pizza instead. For me, I wanted to try the paella. It was calling my name. The set's caesar salad and vegetable soup were good- nothing to complain about. You can also choose green salad or pumpkin soup with the set lunch. And then the paella with chicken, sausage and seafood (NTS580 set lunch)... I don't know why I half expected a mini-cast iron pan of oven baked paella, but instead my dish resembled more of a seafood risotto in looks, texture and taste. It was creamy and soft, with nice touches of saffron. While I'm not a paella expert, I could have swore the last time I had it, it didn't taste like this- maybe it's my own bad for ordering a Spanish dish at an Italian restaurant? I still ate it all, but I just was expecting something different. While my friend enjoyed her crab salad and creamy crab risotto, I didn't think it was completely worth the splurge. The crab meat tasted as if it was frozen and then not defrosted completely, with an icy texture and not sweet like I've had in fresh crab salads in the past. The risotto also had a lot of crab meat mixed inside the risotto, but again it didn't draw out the sweetness of the crab, but rather got a bit lost in the creaminess. Then came the set menu's dessert- which came with a slice of cake and mini scoop of sorbet. There isn't a choice offered on the menu, but if you ask nicely, they'll let you swap out the regular chocolate cake for banana chocolate cake as well as the sorbet flavor. The lemon sorbet was a bit more sour than sweet, but I liked the milk sorbet. The chocolate cakes did not have enough richness for me, but my friends liked the chocolate banana cake. All in all, a decent place for leisurely lunch or maybe afternoon tea, but on the pricey side for lunch at an Italian restaurant. I'd probably end up at Primo Trattoria or even Bellini's (I've fallen in love with their thin crust pizzas lately and staring at the chef making them in the window at the Vieshow location) instead before coming back here again. Or maybe even finally check out Hello Kitty Sweets. Anyone been before? Is there something else on the menu that I missed or should have ordered instead? I often get emails asking me, "I only have 12/24/48 hours to spend in Taipei, where MUST I eat? what are your top 5 places in Taipei?" etc etc. Or I have visiting friends who I want to show around town but they are totally open to want to eat where ever I want to go. It's a lot of pressure to pick the right places! Haha. So I'll try to do certain areas that can be used as a guide for an afternoon or meal if you want to know where I'd take you if we were hanging out in person. One place I end up gravitating towards when friends are visiting is Ximending. It's cheap, it's fast, there's lots to shop and see. It's often compared to Shibuya/Harajuku in Tokyo or Times Square in New York. There's a certain energy from all the people walking around, the gigantic neon billboards spanning across the buildings and movie theater sized screens playing trailers or music videos, gaggles of trendily dressed teenagers, tourists or students in their school uniforms, and rows and rows of shops and shops and food. It's a great way to spend an afternoon or evening in Taipei that feels unique to the city. My suggestions for Ximending is to eat a little at each place and then you can try as much as possible. Another option is to eat at a sit down place, depending on what you like. Ximending is also home to the Modern Toliet restaurant which I have yet to go or recommend, but I know it's very popular those looking for a really different eating experience. So a few weeks ago, this is what I took my new friend Roger to eat when he was visiting Taipei. I won't talk too much about stuff I've reviewed before- you can click on it for old pics/reviews. A five course eating tour for under NT$300 or $10 bucks! You still gotta eat Ah Chung Noodles standing up after you get your piping hot bowl of noodles and pork intestines. I recommend getting a small bowl so you can eat dumplings at the second destination. Don't forget to add a bit of chili sauce, garlic paste and vinegar to spice it up. Only because we spotted KFC on the way to the other side of the street and the Mochi on stick guy was not open that day and my friend didn't mind mixing salty and sweet and back to salty. Like me, he was not a believer that this was a must-try, but after eating it, he understood. Hot, custardy, flaky, good. 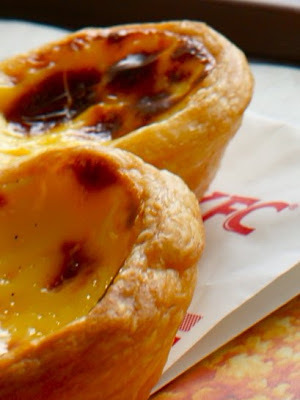 Of course, this doesn't have to be eaten in Ximending- just give it chance if you spot a KFC. I'd had the silky and sweet almond tofu before, with their trademark almond milk in a silver bag to be opened and poured on top, but when I spotted the almond milk snowflake ice, I had to have some. More fine and sweet than regular shaved ice, this also had some almond tofu on the bottom! Score. You can also add your own toppings. This is one of those places I'd never would have found if it weren't for my friend Justin- entire menu of eat is on the wall and under NT$100. We made it there around 2pm and it was still fairly crowded inside. We ordered a set of guo tie or pan fried dumplings and tsui jiao boiled dumplings, since they wouldn't less us order less than 10 each. The guo tie were perfectly fried, with a thin crisped up layer on the bottom, but I tried their house-made chili sauce for the first time today and I couldn't stop dipping my dumplings in it. I asked the lao ban if I could buy some to take home and he said no, but told us how he stir fried the chili peppers in peanut oil. No wonder it had a fragrant, nutty depth since I'm usually not that crazy about chili sauces. Just a block away, we made it to our last stop. Though we were tempted to try out some of the unusual flavors that they are known for, we ended up sticking to the sweet- red bean and lychee. The lychee wasn't as sweet and fruity and too creamy rather than like a sorbet as my previous orders- so I'd stick to guava or peach next time. If you don't want to run around to different places, you can also check out sit down places like Mala Yuanyang Hotpot or Alleycats, or get a bowl of beef noodle soup along with the dumplings at Zhang Ji. Of course there are a TON of places to eat in Ximending, much less in Taipei, but this is what I've discovered so far. 1- Ah Chung Noodles- from the MRT Station exit, look for the McDonalds. It's one alley away from it. 3- Yu's Almond Tofu- go back towards MRT exit, cross the street towards Partyworld, past the shoe store on Chengdu Road. Any other must eats in Ximending? Please share! Maybe I should have listened to my suspicions when the bowl of ramen was only NT$100. But I thought I'd give it a try, especially since my nearby fave Ajisen Ramen was now an run-of-the-mill udon food court shop. I was a bit disappointed when I got the bowl. The lonely piece of meat looked unfulfilling. Then after one bite, I didn't want anymore. The noodles were soggy. The broth tasted like soy sauce broth than anything else. The crab meat was, well, krab. A packet of instant ramen would have been better than this. There was no depth to the bowl. The most interesting thing about it was the spork that it came with that reminded me of sporks I used as a kid from KFC. Kinda cool. It's possible that their other broths or ramens or other locations would be better, but I'm not taking my chances. Back to the Korean place or Mos Burger in that food court. Is a pizza just a pizza? Maybe not, if the name is one like "Chicago Pizza Factory." With this name, I started daydreaming about stuffed pizza with spinach and mushrooms like Zachary's, with tall buttery crust that held in all the baked goodness inside. Stuffed pizza it's not. But it's good pizza, and more importantly, good service. I wanted to order pizza for a party over the weekend, but I wanted pizza where the crust wouldn't get hard if people didn't eat it right away. I'd never tried Chicago Pizza Factory, but they won last year for "Best Delivery" on my Hungry Readers Best of Taipei poll, so I thought I'd order a test run few days earlier. When I called to ask for delivery, the owner said it was only possible with 2 pizzas from how far I lived from them, but they were having a special 2 pizzas for NT$800. I was okay with that and the owner happily made recommendations since I didn't have a menu (and they don't have one online, but you can try to decipher this one.) with pizza names like Boss No. 1 and Chef's Special. I ended up ordering a large Hawaii (No. 10) and large Chicago No. 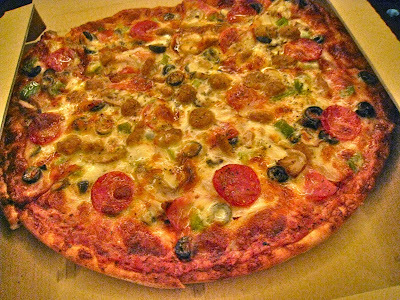 8 (which is like a "Supreme combo" with extra cheese, pepperoni, sausage, ham, black olives, green pepper, mushrooms, onions). Once the owner could tell I was speaking English, he easily switched to English and asked if I was from the States. When I responded I was, he suggested that I get my pizzas with "extra sauce because the locals like it with less sauce" and people from the US like it with more. You can also choose between thin crust, thick crust or extra thick crust. I opted for one thin and one thick. He was right- when I got the pizza, it didn't seem like it had more sauce, it seemed just right. The pizzas arrived promptly before I knew it in about 40 minutes, and came hot. The only slight mishap was the Combo No. 8 pizza slid and was smooshed on one side. The difference between thin and thick crust is not huge (like the difference between Pizza Hut's thin and pan pizza). The pizza reminds me a bit of Papa John's- it's not gourmet, but it tastes kind of like home- loaded with fresh ingredients and cheese with lots of sauce and a pliable hearty crust. But if you want to get something for your relatives, they have pizzas topped with shrimp and corn too. Chicago Pizza Factory is actually a chain in Japan and you can see on their website that they have a lot of other localized variations, complete with a tic-tac-toe grid of mayonnaise. I liked how the crust doesn't get hard when it cooled unlike the pizzas I've had from Famous Larry's or Alleycats, which doesn't deliver. While Famous Larry's does deliver, I've had two bad experiences with their delivery which each took over an hour (the first time over an hour and half) and the second time my order was messed up without much apologies when I called to inform them when I found out. I like their pizzas by the slice when eaten hot, but their crust tends to get rock hard when cooled. If you're looking for an even better deal, if you eat in or get your pizza to go (rather than delivery), you can get 2 pizzas for NT$500. (Which is what I ended up doing for the party since I was ordering 6 pizzas... NT$1500 vs NT$2400- it's worth it to pick it up yourself!). But if it's a rainy typhoon kind of night, you can just stay in and wait for your pizzas. Just don't forget to ask for extra sauce. Wrapping up what seems to have turned into dessert week this week on the blog, here is a look at Hielo, the latest addition to the new frozen yogurt wave in Taipei. First of all, let's talk about the name. After some digging, it turns out the "hielo" is the Spanish word for ice. But it's so strange that you're naming a froyo store in Spanish in a country that dubs Dora the Explorer in Chinese or lacks popularity of Mexican or Spanish foods. The store is cute and inviting enough for frozen yogurt experts and novices. The cashier helpfully offers little cups of samples and asks if you have any questions. There's plenty of area to sit down and eat. The signs make it fairly easy to decipher how to order- pick a flavor, pick a size, pick your toppings. Hielo offers two flavors- original tart and uji matcha AKA green tea. You can also get a shake or coffee, or cushion your yogurt in a waffle bowl. The toppings range from the typical fruits and berries to the cereal/cookie toppings, including watermelon, pineapple, orange and kiwi. What was slightly annoying was that if I wanted to pick a raspberry or blueberry topping, I had to pay an extra NT$40 per topping. 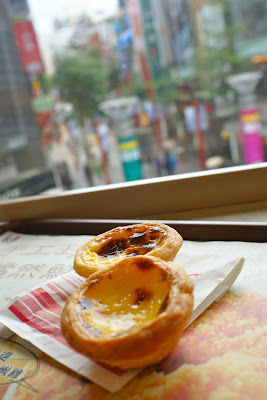 So we decided against that and got a small original flavor with strawberry and mango (NT$115). The small is definitely enough to share between two people. My friend who was with me had never had Pinkberry before and enjoyed the tart and sweet flavor of the yogurt and fresh fruits. 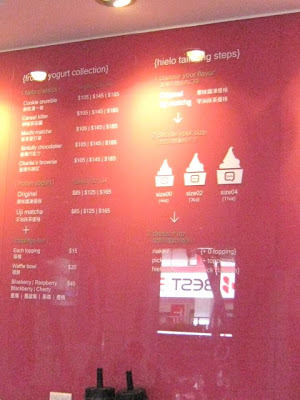 I'd probably stop by again as I'm in this area often, but with this pricing, I'd probably revisit the self-serve pay as you weigh Yogurt Art down the Zhong Xiao road, as they have more flavors and rumored fruits and berries now, or wander over YoFroyo, which is nearly half the price. I also wish one day one of these places would have yogurt chips. Yogurt chips, please! 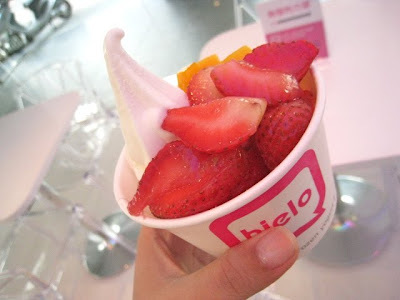 For those of us who are a few years over Pinkberry/Yogurtland/Red Mango, Hielo might be a little late, especially with the weather cooling. But for those who are new to the tart-is-in flavors, Hielo might be a refreshing change from the corner shaved ice or too sweet ice cream choices. And btw, has anyone been to Yogurt Me lately?